Add water to a small saucepan and bring to boil. Add bag of black tea and let sit for approx. 5 min. before removing tea bag. Add sugar and stir untill sugar is fully disolved. Let simmer for approx. 5 min., then set aside to let cool. 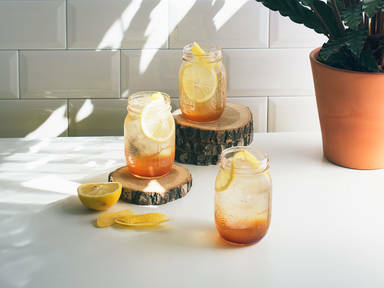 Combine some of the black tea syrup with lemon juice in a mason jar and give it a quick stir. Add ice and top with non-alcoholic sparkling wine. Give it a gentle stir to combine all ingredients. Garnish with lemon zest or lemon slice. Cheers!